When James II succeeded his father in 1685, he continued to issue copper halfpennies, albeit via a ‘patent’ like his father did before him. This maintained the flow of small change but the same ‘decades old’ problem persisted with the large proportion of under-weight ‘clipped’ silver in circulation. This might have sufficed for transactions in Ireland between the Irish but it was not acceptable for transactions with foreign traders or importers – thus the presence of foreign specie’ (silver and gold coins) remained an important part of Irish trade and commerce. For James II, however, as the deposed king at the head of an invading army, the problem was particularly acute – he had to pay his troops and he had to pay their suppliers in Ireland … and, in the event of a long campaign, his cash wasn’t going to last forever !!! On March 12, 1689, James landed at Kinsale, attended by a French fleet of over thirty warships, with thirteen attendant vessels of 2,223 guns and 13,000 seamen, and provided with 500,000 crowns (£125,000) in his war chest. He was met at Cork by his Viceroy, Tyrconnel, and they reached Dublin on March 24. An added problem was that he needed to recruit Irish troops to his cause and , so, he could ill-afford to make himself (or his invading army) unpopular. Consequently, he not allow his troops to ‘live off the land and loot’ … so he had to pay for everything they needed. In his Parliament in Dublin, the so-called “Patriot Parliament” of 1689, James II found himself in an even more precarious position insofar as he had to tread a very line between repairing his reputation with the Protestant majority in England (where he hoped to return to power) and cultivating the support of Irish Catholics (on whom he depended upon for immediate support). A parliament in Dublin, in opposition to a parliament in Westminster, proved to be very difficult to control. Act of Attainder against the Protestant landowners, which was designed to repair his brother’s unjust Act of Settlement, was wrung from him against his will. It is not, however, beside the mark to recall that James himself, as Duke of York, had been one of the largest profiteers by the Act, for under it he became possessed of over 120,000 acres of the best land in the country, recovered from Cromwell’s regicides. This one piece of legislation proved to be a breaking point for any delay in action by William of Orange and resulted in preparation for an extension of the so-called “Williamite Wars in Ireland. It was preceded by a reversal of the Act of Settlement; it swept away 12,000,000 acres from the Protestants and from those Catholics who had in many cases purchased lands from them, and drove away in terror a multitude of owners, who now followed the fifteen hundred families who had already taken refuge in Scotland under Tyrconnel’s administration. The objective of restoring properties to the original owners cannot be said to be wholly unjust, but it was accompanied by a general condemnation to death – which was, in principle, as indiscriminate as any previous law passed by Cromwell’s parliament. This would divide Ireland’s Catholics and drive away Ireland’s Protestants from any likelihood of supporting James. The age of the ‘Divine Rights of Kings’ was well and truly over and his Irish subjects who designed this Bill infuriated James when they “deprived him of his right, as sovereign, to pardon any of the accused,” thus taking from him one of the main privileges and undoubted rights of the Crown. It seems as if James was riding a runaway horse and he had little choice but to hang on and see where it took him. Even the military campaign that James led in Ireland was not creditable to a man who had served in three campaigns with the great Turenne, fought against Conde and Spain, and been Admiral of the Fleet in England. With the huge amount of foreign silver and gold in Ireland, and with its economic importance, it was imperative to prevent the removal of this ‘specie’ from Ireland – thus James set out a table of coin values on May 29th, 1689. 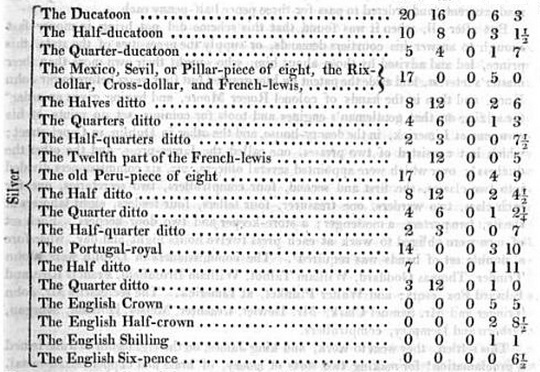 Unlike previous tables containing rates of exchange, this table also includes English coins – guinea and half-guinea (gold) and crown, halfcrown, shilling and sixpence (silver). James already had a mint operating in Ireland – the one used to mint copper halfpennies and operated by Messrs. Knox and Moore. This new ‘fiat’ currency would be on such a large scale, he would need to ‘mechanise’ its production – but that is another, much more complex story.